SAAB 900 turbo fanns med i John Garners första bok som James Bond författare, året var 1981. Fakta: SAAB 900 turbo fanns med i John Garners första bok som James Bond författare, året var 1981. I sin första Bond novell 1981, "Licens förnyas", Han lät Bond få ett nytt märke - Saab "Silver Beast". 007's SAAB 900 Turbo which featured in John Gardner's debut 1981 Bond novel "Licence Renewed"
John Edmund Gardner, född 20 november 1926 i Seaton Delaval, Northumberland, död 3 augusti 2007 i Basingstoke, (i en hjärtattack), var en brittisk kriminalförfattare. John Gardner took over the 007 literary torch in 1981 after a long hiatus since Kingsley Amis' one Bond novel "Colonel Sun". 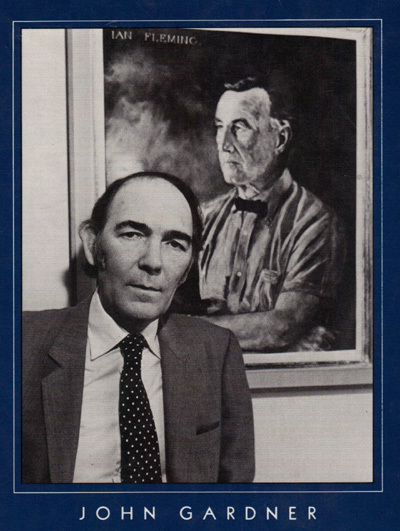 Gardner continued the legacy by producing an astounding 14 original novels and two movie novelisations. John Gardner tog över 007 litterära fackla i 1981 efter ett långt uppehåll sedan Kingsley Amis "en Bond novellen" Colonel Sun ". Gardner fortsatte arvet genom att producera en häpnadsväckande 14 ursprungliga romaner och två filmen novelisations. Above: This rare promotion photograph was produced in conjunction with the 1981 Novel 'Licence Renewed'. The 1979 900 was available in three versions: The GL had the single-carb 99 hp/73.5 kW engine, the GLS had twin carburetors for 106 hp/79.5 kW, the EMS and GLE had fuel injection for 116 hp/87 kW, and the 900 Turbo produced 143 hp/107 kW. A five-speed transmission was introduced in the EMS and Turbo for 1980. The only bodywork originally available was the three or five-door hatchback style, which was seen as more modern at the time. The vehicle also had an aviation-inspired curved windscreen for better visibility and an aircraft style dashboard. The dashboard itself had been arranged according to the frequency of use and/or importance of the various controls and gauges. A few years ago, the very idea that one day, fictional hero James Bond would be driving a Saab, might well have been ridiculed. Now it’s happened; and it’s not seen as incongruous, but as a confirmation of the Saab image. 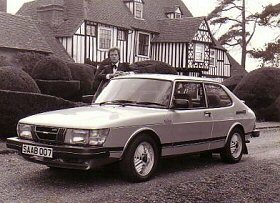 That alone is a measure of the way in which the Saab 900 turbo has caught the imagination of the public. As soon as it was introduced, the Saab turbo was hailed as a car which genuinely broke new ground: the performance car of the future. It brought the mystique and appeal of turbocharging into the realms of family motoring, and offered a combination of performance, economy and practicality which is still unique. 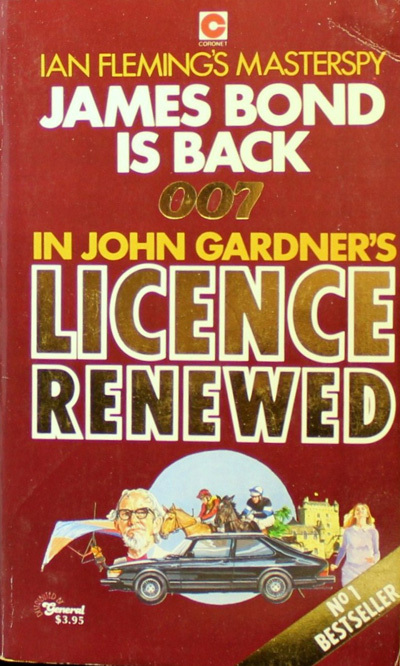 Then, in May 1981, the new James Bond novel —‘Licence Renewed’ by John Gardner—was published to great critical acclaim and an immediate place in the best seller lists, where it was to stay for some weeks. 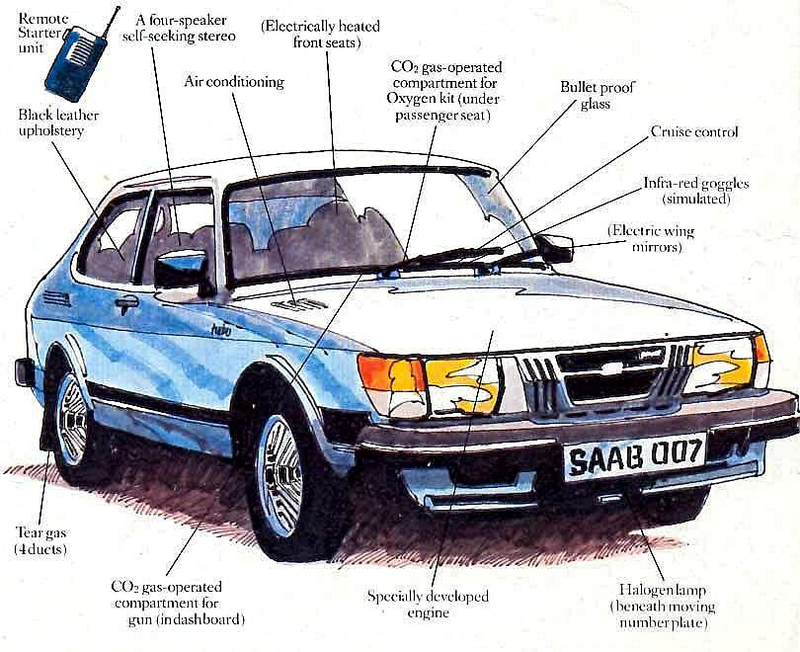 The James Bond Saab is fitted with all those little extras essential to the modern secret agent as shown in the picture below. Note the specially developed turbo engine which, with the aid of water injection raises the power to 175 BHP—still from only 1985 cc!— and provides a 0-60 mph time of less than 8 seconds. Top speed? 145 mph plus. These special refinements raise the Saab 900 range to a new level of prestige and credibility— alongside the Bentley, Aston Martin and Lotus previously associated with Bond. Aircraft headlight hidden behind front license plate. 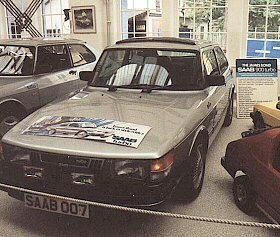 In his first Bond novel in 1981, "Licence Renewed", he let Bond venture away from his traditional Q-branch vehicles to a new brand - the Saab "Silver Beast". I sitt första Bond novellen 1981, "Licens förnyas", han lät Bond venture bort från sin traditionella Q-filial fordon till ett nytt märke - Saab "Silver Beast". 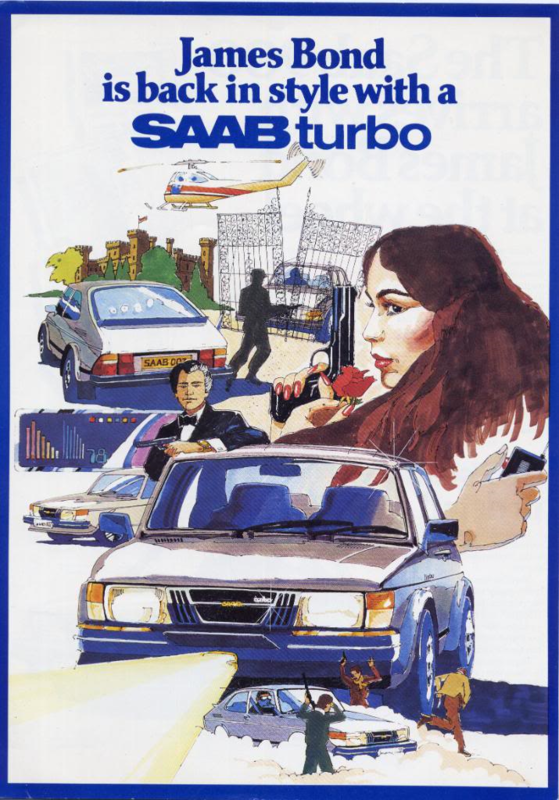 The SAAB 900 Turbo saw Bond depart from his earlier Bentley's and Aston Martin's and have his own personally modified car by the multinational "Communication Control System" and not Q-Branch. Saab 900 Turbo såg Bond avvika från sin tidigare Bentley och Aston Martin och har sitt eget personligen modifierade bil av multinationella "Meddelande Control System" och inte Q-Branch. The real life counterpart SAAB 900 Turbo was launched in 1980 and was seen at the time as a car which broke new ground, offering the public high-end performance and practicality. 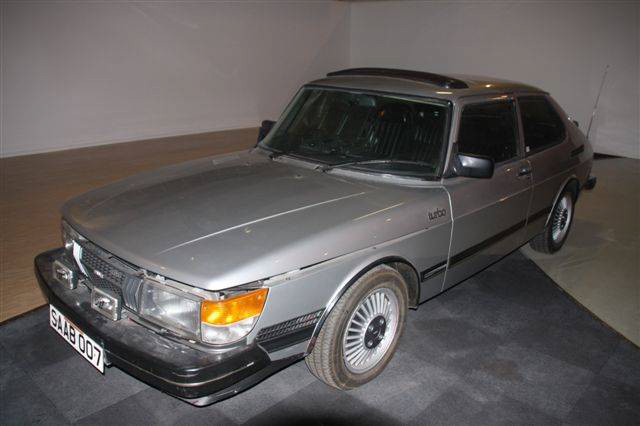 Den verkliga livet motsvarighet Saab 900 Turbo lanserades 1980 och sågs då som en bil som bröt ny mark genom att erbjuda allmänheten high-end prestanda och praktiska. SAAB's prestige and automotive credibility were raised to levels shared by other Bond thoroughbreds - Bentley, Aston Martin and Lotus. SAAB: s prestige och fordonsindustrin trovärdighet togs upp till nivåer som delas av andra Bond thoroughbreds - Bentley, Aston Martin och Lotus. Above: This rare promotion photograph was produced in conjunction with the 1981 Novel 'Licence Renewed'. Ovan: Detta sällsynta fotografi har producerats i samarbete med 1981 nya "License förnyade". 1981 saw the release of John Gardner's first 007 novel "Licence Renewed", which was published to great critical acclaim. The book introduced us to new the "Silver Beast" and its refinements, and the car went on to see action again in two more Gardner titles in 1982's "For Special Services" and "Icebreaker" in 1983. 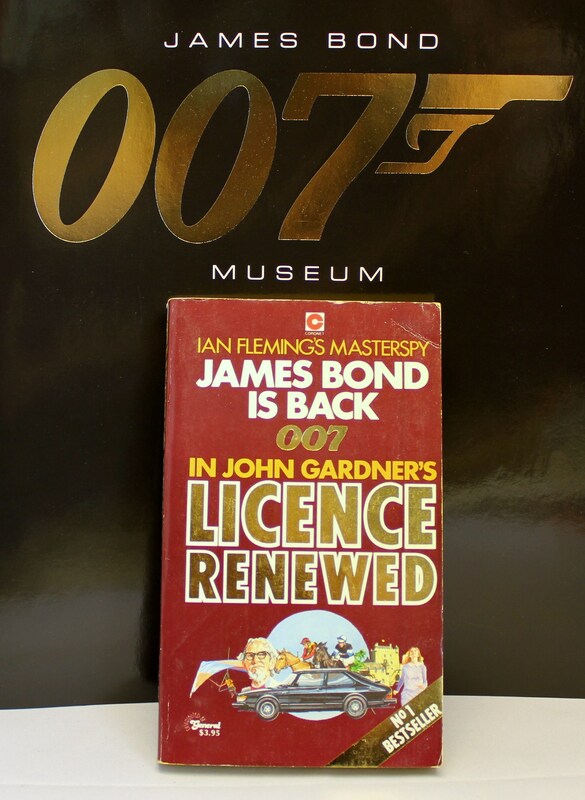 1981 såg frisläppandet av John Gardner: s första 007 nya "License förnyade", som kom till stor kritisk bifall. Boken infördes oss till den nya "Silver Beast" och dess finesser, och bilen fortsatte med att se handling igen i två mer Gardner titlar i 1982: s "för särskilda tjänster" och "Icebreaker" 1983. "The Bentley was ridiculous. In many ways so was the Aston Martin, because I regarded it as a fairly flash motor car. I had to get away from that, and I liked the Saab, it was a very safe motor car indeed." "Den Bentley var löjligt. På många sätt så var det Aston Martin, eftersom jag ansåg att det var en ganska flash bil. Jag var tvungen att komma bort från det, och jag tyckte om Saab, det var en mycket säker bil faktiskt." "You could clock up the miles on it, you could clock up the speeds on it. I had a Saab right up until I stopped driving two years ago, and loved them." "Du kan klocka upp den miles på den, du kan klocka upp hastigheter på det. Jag hade en Saab ända tills jag slutade att köra för två år sedan, och älskade dem." 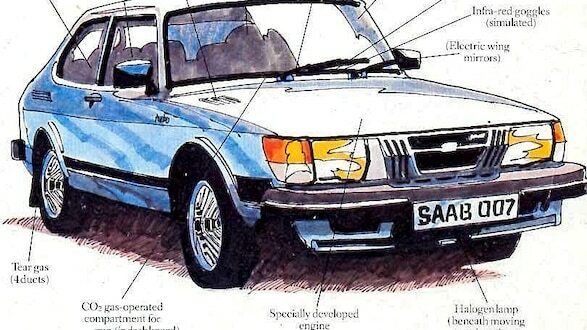 In 1982 a specially created SAAB was developed based on what had been written by Gardner the previous year. 1982 ett speciellt skapat SAAB har utvecklats baserat på vad som hade skrivits av Gardner föregående år. The car was a fully working version of its fictional cousin, including a specially developed turbo changed engine with water injection raising the power to 240 BHP from 2000cc and provided 0 - 60 MPH in less than 7 seconds. Bilen var en helt arbetar version av sin fiktiva kusin, inklusive en särskilt utvecklad turbo ändrats motorn med vatten injektion öka kraften till 240 BHP från 2000cc och gav 0 - 60 km / h på mindre än 7 sekunder. Communication Control Systems, Ltd. (now called Security Intelligence Technology Group) is actually a real company, which advised author John Gardner with ideas about feasible gadgets to be used. Consequently, Gardner gave them the credit in the book, rather than Q Branch. 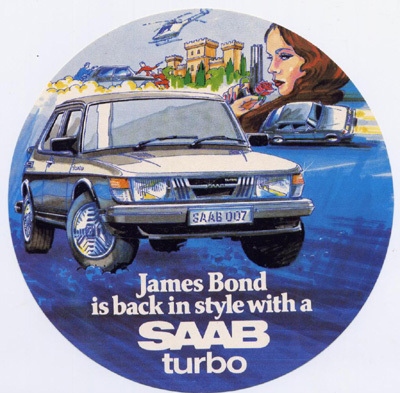 With the release of Licence Renewed, Saab took the opportunity to launch a Bond themed promotional campaign complete with an actual car outfitted like the one in the book (but using smoke dispensers instead of tear gas). The Saab 900 Turbo, introduced in May of 1978, was Bond's vehicle of choice in many of the John Gardner Bond novels, beginning with Licence Renewed (1981). Dubbed, the "Silver Beast", it is Bond's private vehicle modified by the real-life company Communication Control Systems, Ltd. (CCS) (now called Security Intelligence Technology Group). 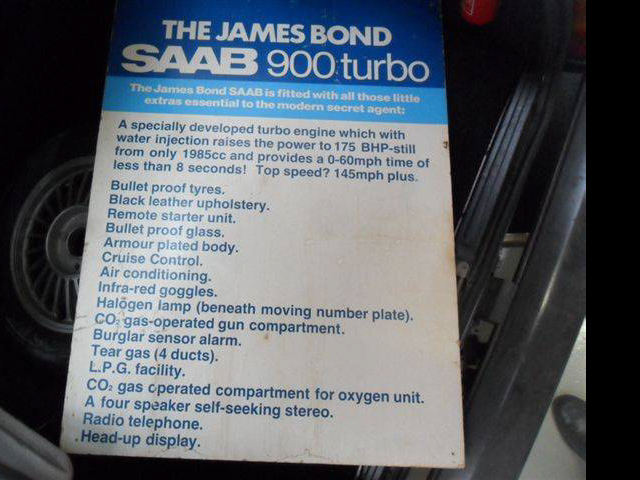 SAAB 900 Turbo 1981 James Bond Silver Beast Specification. John Gardner till vänster och författarkollegan Douglas Rutherford VÄRLDSDECKARKONGRESSEN 1981 i Stockholm. 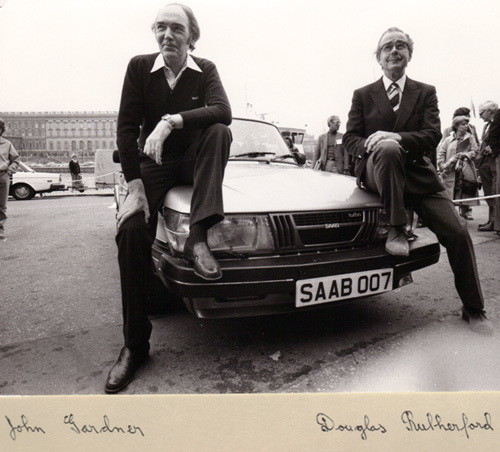 John Gardner och SAAB 900 SAAB007utanför GRAND HOTEL med utsikt mot Kungliga Slottet. John Gardner till vänster och författarkollegan Douglas Rutherford VÄRLDSDECKARKONGRESSEN 19 Juni 1981 i Stockholm. John Gardner and his The James Bond Books and SAAB 900 utanför GRAND HOTEL med utsikt mot Kungliga Slottet. Saab 900 Turbo 007 "Silver Beast"
He is bulletproof, has a night vision device and can spray tear gas. 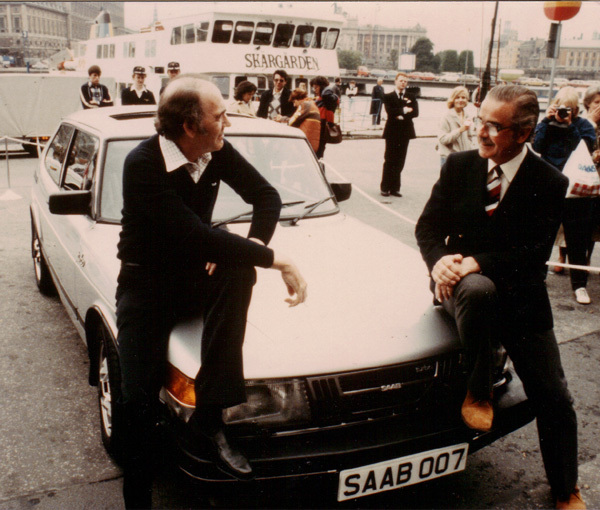 In 1981, Top Agent 007 drove in Saab. We unravel the mystery of James Bond's most bizarre company car. What is the most important feature that a secret agent's car should have? Right: It has to be as inconspicuous as possible. True top spies will probably take the bus to submerge unnoticed in the crowd. Not so James Bond 007. If Goldfinger, Blofeld, or Le Chiffre want to know if their nemesis MI6 is on their way, they just have to look for the most eye-catching and glamorous sports cars. If a perfectly dressed gentleman with the shaken martini glass drives in an Aston Martin or Lotus, the villains know that now our dark plans are in real danger. If 007 on the other hand, every now and then in normal cars such as a duck or a Russian Zaporozhez must go, then only as a nice gag for the movie action. 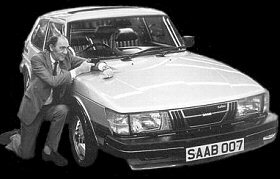 But in 1981, 007 sat on Saab. A brand that at that time packed technical innovations and exemplary safety concepts as inconspicuously as hardly any other manufacturer. Wait a minute, 007 connoisseurs will object now: In the movie "In Deadly Mission" from 1981, James Bond cruised around in the Lotus Esprit Turbo. That's right, of course. But real fans do not just include the movies, but also the novels. 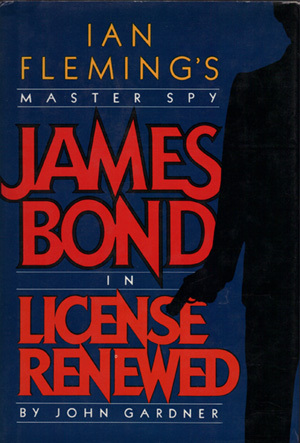 And John Gardner, who officially continued Ian Fleming's novels in the 1980s, put the secret agent behind the wheel of a Saab 900 Turbo in his story "License Renewed" and in the following novels. In Germany, the book got the title "Countdown to Eternity". 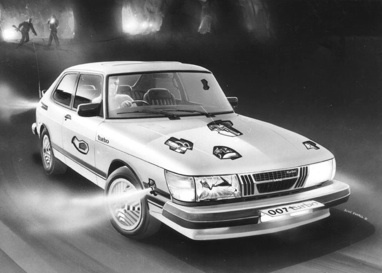 Although the rolling Swedish steel lacked the glamor factor of an Aston Martin, the "Silver Beast" Saab was a genuine Bond car. He had bulletproof windows, his own oxygen supply, a night-vision device, a head-up display, a license plate changer like the Aston Martin DB5 from "Goldfinger" and a device to fire tear gas. The turbo engine had been bred to 175 hp. On comfort 007 also had to do without: Black leather interior, air conditioning, heated seats, cruise control and car phone were on board. "I did not want an Aston Martin anymore"
On the Swedish fan site www.007museum.com you can read the whole history of what is probably the least known Bond car of all time. "I just wanted to get away from Bentleys and Aston Martins," John Gardner, who died in 2007, once said in an interview, "and I liked the Saab - it was really a very safe car." 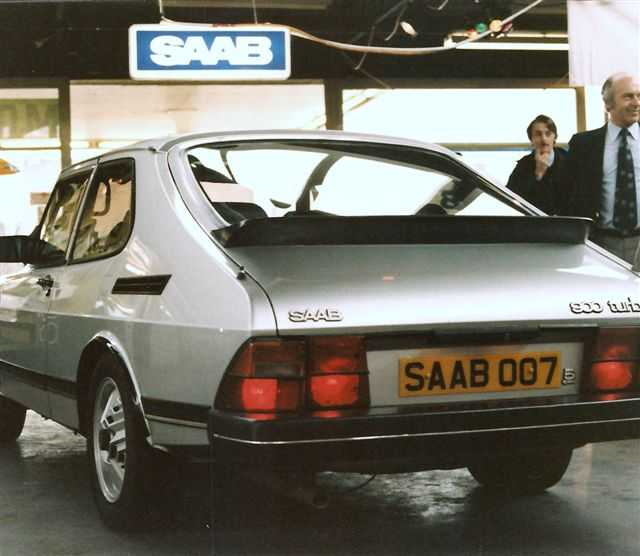 007 fans were so taken by Bond's new company car that Saab even rebuilt the car 1-1. The fact that the "Silver Beast" never made it to a James Bond movie is well known. To Roger Moore, the on-duty Bond in the 80s, the car would have probably not really fit - although Moore swore in the 60s in the famous action series "Simon Templar" ever on Swedish steel, namely a Volvo P1800. But when Timothy Dalton brought a brand new, more modern, more realistic and harder Bond to the screen at the end of the 80s, the idiosyncratic Saab would have been the ideal choice. Instead, they equipped 007 with an Aston Martin V8 Vantage. For a few short scenes, it was even the first time a German manufacturer managed to smuggle himself into a bond strip and 007 behind the wheel of an Audi 200 Quattro set. What to do at turbo lag? Er ist kugelsicher, hat ein Nachtsichtgerät und kann Tränengas versprühen. 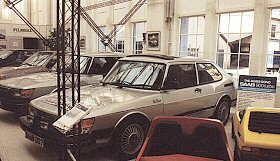 1981 fuhr Top-Agent 007 im Saab. Wir lüften das Geheimnis um James Bonds skurrilsten Dienstwagen. Was ist das wichtigste Merkmal, das das Auto eines Geheimagenten haben sollte? Richtig: Es muss möglichst unauffällig sein. Echte Top-Spione nehmen wahrscheinlich den Bus, um unbemerkt in der Masse unterzutauchen. Nicht so James Bond 007. Wenn Goldfinger, Blofeld oder Le Chiffre wissen wollen, ob gerade ihr Erzfeind vom MI6 im Anmarsch ist, müssen sie nur nach den auffälligsten und glamourösesten Sportwagen Ausschau halten. Fährt ein perfekt gekleideter Gentleman mit dem geschüttelten Martini-Glas in einem Aston Martin oder Lotus vor, wissen die Bösewichter: Jetzt sind unsere finsteren Pläne aber mal richtig in Gefahr. Wenn 007 dagegen hin und wieder in Normalo-Autos wie eine Ente oder einen russischenSaporoschez einsteigen muss, dann nur als netter Gag für die Filmhandlung. Doch 1981 setzte 007 auf Saab. Eine Marke, die damals technische Innovationen und vorbildliche Sicherheitskonzepte so unauffällig verpackte wie kaum ein anderer Hersteller. Moment mal, werden 007-Kenner jetzt einwenden: Im Film „In tödlicher Mission“ von 1981 kreuzte James Bond doch im LotusEsprit Turbo durch die Gegend. Das stimmt natürlich. Doch für echte Fans zählen nicht nur die Filme, sondern auch die Romane. Und John Gardner, der in den 80er Jahren offiziell Ian Flemings Romane fortführte, setzte den Geheimagenten in seiner Story „Licence renewed“ (wörtlich übersetzt: Lizenz erneuert) und in den folgenden Romanen ans Steuer eines Saab 900 Turbo. In Deutschland bekam das Buch den Titel „Countdown für die Ewigkeit“. Auch wenn dem rollenden Schwedenstahl der Glamour-Faktor eines Aston Martin fehlte, so war der „Silver Beast“ genannte Saab doch ein waschechtes Bond-Auto. Er hatte kugelsichere Scheiben, eine eigene Sauerstoffversorgung, ein Nachtsichtgerät, ein Head-Up-Display, einen Nummernschild-Wechsler wie einst der Aston Martin DB5 aus „Goldfinger“ und eine Vorrichtung, um Tränengas abzufeuern. Der Turbo-Motor war auf 175 PS hochgezüchtet worden. Auf Komfort musste 007 auch nicht verzichten: Schwarze Lederausstattung, Klimaanlage, Sitzheizung, Tempomat und Autotelefon waren an Bord. 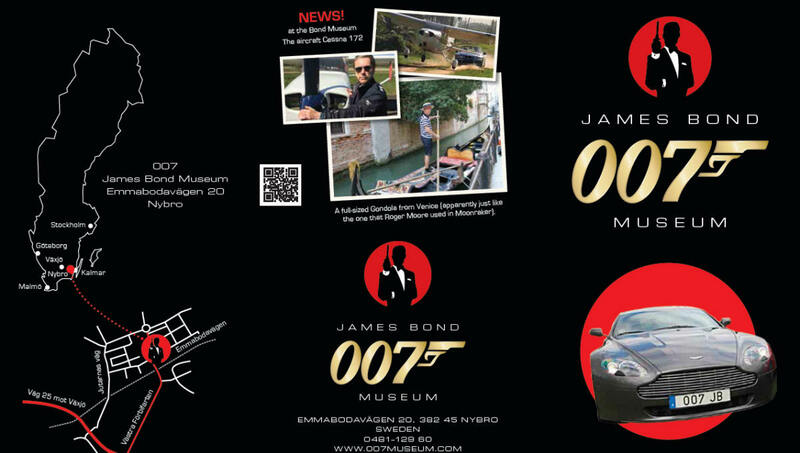 Auf der schwedischenFan-Website www.007museum.comkann man die ganze Geschichte des heute wohl unbekanntesten Bond-Autos aller Zeiten nachlesen. „Ich wollte einfach von Bentleys und Aston Martins loskommen“, sagte der 2007 verstorbene John Gardner einmal in einem Interview, „und ich mochte den Saab– es war wirklich ein sehr sicheres Auto“. 007-Fans waren so angetan von Bonds neuem Dienstwagen, dass Saab das Auto sogar 1:1 nachbaute. Dass es das „silberne Biest“ nie in einem James Bond-Kinofilm schaffte, ist bekannt. Zu Roger Moore, dem diensthabenden Bond in den 80ern, hätte der Wagen wohl auch nicht wirklich gepasst – obwohl Moore in den 60er Jahren in der berühmten Actionserie „Simon Templar“ ja schon einmal auf Schwedenstahl schwor, nämlich einen VolvoP1800. Doch als Timothy Dalton Ende der 80er Jahre einen völlig neuen, moderneren, realistischeren und härteren Bond auf die Leinwand brachte, wäre der eigenwillige Saab die ideale Wahl gewesen. Stattdessen stattete man 007 mit einem Aston Martin V8 Vantage aus. Für ein paar kurze Szenen gelang es sogar erstmals einem deutschen Hersteller, sich in einen Bond-Streifen zu schmuggeln und 007 ans Steuer eines Audi200 Quattro zu setzen. So blieb der Traum mancher Architekten, Künstler und Oberstudienräte, als klassische Saab-Klientel in einem echten Bond-Auto durch die Gegend zu kreuzen, auf die Romanwelt beschränkt. Ohnehin hatte Saab nach dem 900 durch die Liaison mit General Motors und die folgende Verwässerung der Marke nichts Kultverdächtiges mehr im Angebot. Und schließlich teilte Saab sogar das Schicksal aller Bond-Bösewichter – die Marke hat das Zeitliche gesegnet. Dabei hätte Saab die Leinwand so schön nutzen können, um das Problem der frühen Turbomotoren nonchalant zu überspielen: James Bond hätte sich während des Turbolochs wahrscheinlich noch schnell die Krawatte gerichtet.